A familiar presence in Hawaii, Loretta Ables Sayre recently earned a Tony® nomination for her performance as Bloody Mary in the 2008 revival of Rodgers and Hammerstein’s South Pacific. Though she has been a performer for many years, that marked her Broadway debut. Born in Stockton, California, Sayre moved with her family to Hawaii when she was a child. She was attracted to music early on, listening to her mother’s recordings of chanteuses like Dinah Washington and Sarah Vaughan and participating in school productions. In high school she became acquainted with Rodgers and Hammerstein’s South Pacific through a simplified performing version of the musical. Her activity as an entertainer took off after college, when she built a reputation as a singer and worked in a hotel built on the site where, in the 1958 movie of South Pacific, Emile de Becque (the leading male) supposedly lived. For her show there, she wore traditional costumes and sang tunes from the musical. 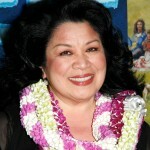 In the late 1970s, she broadened her fan base by singing on the pop hit “Honolulu City Lights” with the Hawaiian duo Keola and Kapono Beamer. By 1981 she was the opening act at the Monarch Room of the Royal Hawaiian Hotel. In the mid-1980s she joined a touring production of Michael Cowell’s Song for the Navigator, a comedy for young audiences, set in the South Pacific. 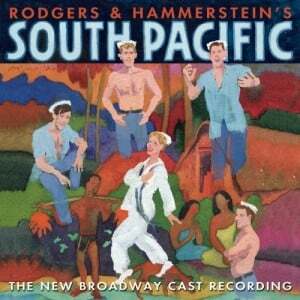 The production had performances in Australia, Micronesia, and the United States (including the Kennedy Center). Her career in musical theater moved up several notches in 1989, when she played Effie – the big-voiced but not-glamorous-enough member of a female R&B trio – in Dreamgirls at the Hawaii Theater. For a decade she sang at the Lewers Lounge in the Halekulani Hotel in Waikiki, and she was voted Favorite Female Vocalist by the readers of Honolulu Magazine. At the Hilton Hawaiian Village, she was the opening act at New Year’s Eve Concerts for the Four Tops, James Brown, the Beach Boys, and Kenny Loggins. She returned to musical theater in 2002 to play the lead in Lee Cataluna and Keola Beamer’s hit musical You Somebody, which she reprised in 2007, winning the Hawaii State Theater Council’s Po’okela Award for Leading Female in a Musical. Her Broadway debut came about almost by chance when a friend of hers persuaded the casting director of a new production of South Pacific to look to the actual South Pacific for some of the roles. She flew to New York, auditioned for the part of Bloody Mary – the woman on the exotic island of Bali Ha’i who hopes that Lieutenant Cable will marry her daughter – and got it. The 2008 won multiple Tonys®, including Best revival of a Musical, with Ables Sayre earning a Tony® nomination for Best Featured Actress in a Musical and winning the Theatre World Award. Ables Sayre’s television credits include Magnum, P.I. ; Byrds of Paradise; Baywatch Hawaii; Hawaii; North Shore; and Beyond the Break.